Home Politics Dimeji Bankole’s ADP supporters defect to APC in Imala, Abeokuta North. Dimeji Bankole’s ADP supporters defect to APC in Imala, Abeokuta North. Action Democratic Party (ADP), Hon. Sabur Dimeji Bankole led by Hon. 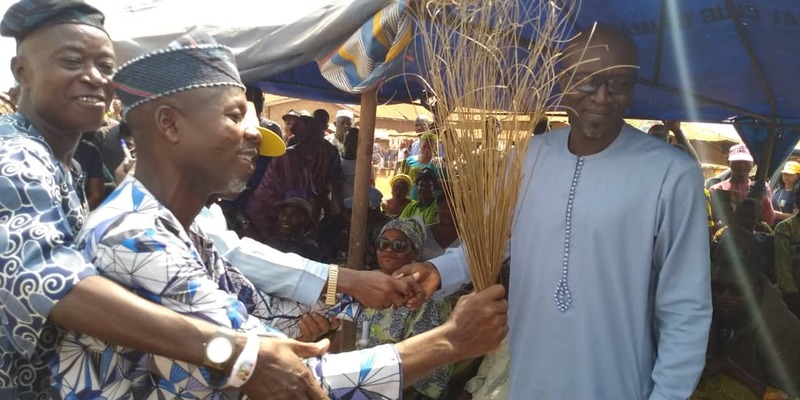 Ponle Olajunbe defected to All Progressives Congress (APC) on Saturday at Ward 14, Imala/Idi-emi in Abeokuta North Local government when the campaign team of Dapo Abiodun campaign organization led by Dr. Sunday Oluniyi Akintona visited Imala town. Ponle said it became imperative for them to join the All Progressives Congress APC as they were not sure ADP could win governorship election in Ogun State. He promised to lead other ADP defectors to APC when the party governorship candidate, Prince Dapo Abiodun would visit the local government this week. Goodwill messages were delivered from Oke Ogun leaders included Chief Ahmed Taiwo, Prince Timmy Akindele, Hon. Olumide Biyi, and others.